Saint-Barthelemy, (or St Barts, St Barths or St Barth!) was named by Christopher Columbus after his brother in 1493. This rocky little outcrop of just 14 square miles is a real jewel. No other island in the world can match its unique blend of style, history and nature. After an adventurous past, St Barts has become a favourite hideaway of sophisticated travellers and jetsetters, attracted by its beauty and its ambience of casual elegance. The increase in tourism has seen the population jump from about 3,000 in the early eighties to more than 8,000 by the late noughties, but the development has been harmonious thanks to building restrictions. The locals are descendants of the early French settlers from Brittany and Normandy. Previously fishermen, their way of life has changed dramatically with the advent of tourism, as little as 40 years ago, most homes did not have power or water, and there were almost no cars, hotels or restaurants. French is the official language, although Creole, French patois and English is widely spoken. There are now numerous gourmet restaurants that rank among the best in the world, top-notch hotels and spas, beautiful boutiques and more than 20 gorgeous beaches. A number of marine parks offer excellent snorkelling, and there are great spots for surfing, wind- and kite-surfing. It’s easy to see why the superyacht fraternity comes here in force each year for the spectacular Bucket sailing regatta. Anse du Columbier: A beautiful bay terminating in a sandy beach surrounded by low scrub covered hills. This whole bay was once owned by the Rockefeller family who built the picturesque villa, this pristine bay’s sole house, that sits on the southern headland and, inaccessible by road and well protected by National Park status remains much the same to this day. 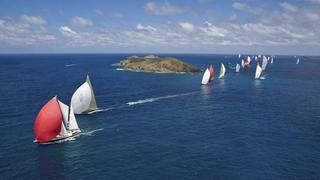 In March for the St Barts Bucket sailing regatta, and at Christmas and New Year for serious partying. 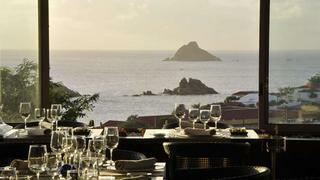 Eden Rock Hotel: Breathtaking views and the finest cuisine on this island of superlatives. St Barths is great a real highlight but the airport is terrifying – it’s better to fly to St Martin and get a helicopter or boat over.